Observation - Lichens at Sea Shore - UK and Ireland. 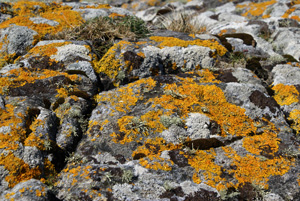 Description: This lichen was observed in May 2008. I am fairly sure the grey coloured lichen is Crustose and the orange coloured area could one possibly Foliose but I am less than sure about that. This lichen was observed in May 2008. I am fairly sure the grey coloured lichen is Crustose and the orange coloured area could one possibly Foliose but I am less than sure about that.